This article was written by Ian Miles who is the owner of Leo, one of the pet hedgehogs involved in my ringworm article. 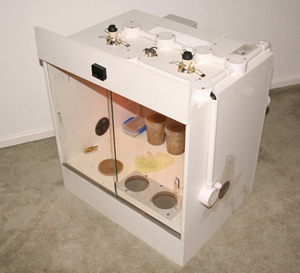 It describes how he built his own locust incubator and provides some good tips for anyone thinking about constructing one for themselves. For our American readers, Ian is lives in the UK so all the stores he mentions are UK based. You guys can probably find everything used here at your local Home Depot (I think the only thing they don’t sell in Home Depot are nuclear submarines). I decided to try my hand at constructing a suitable cage or housing in which to rear purchased young locusts to feed to our newly acquired African Pygmy hedgehog. I had never done anything like this before so decided to search the net. 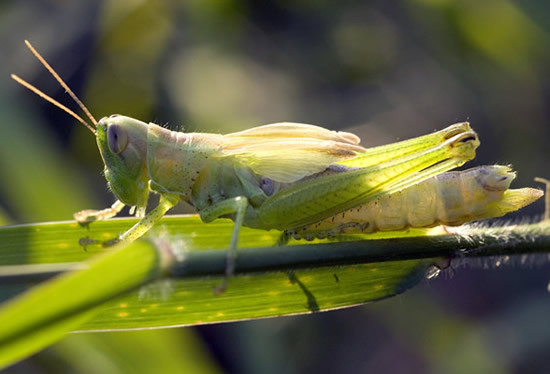 Over the next week or so I searched hundreds of sites and forums trying to find a decent guide or account of how to raise and possibly breed Locusts. None of them had what I would consider to be a suitable guide. Using bits gleaned from various sites I set off to the local timber merchants and also ordered some of the electronics from various web sites. I drew up a list of the major 6 requirements and these formed the basic design and operating guidelines. A housing of approximately 2ft wide 2ft high and about 18 inches from back to front. Lots of ventilation, as a damp environment causes fungal infections which are lethal. Containers of about 5 inches deep to hold the moist sand for egg laying. I decided to make the unit as simple to run as possible and therefore as automated as possible. I didn’t want the hassle of having to physically turn lights on and off for set periods of time. The first purchase was a two channel timer to give me my set day and night periods. The second to control the daytime temperature was a Habistat dimming thermostat as I wanted to use light bulbs as my daytime heat source. 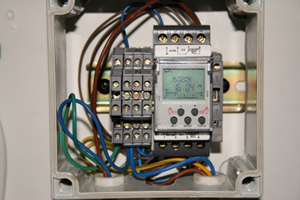 These thermostats never actually turn the lights off they simply dim them as the required set temperature is reached. As the environment cools the lights brighten again giving more heat. 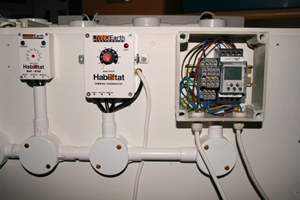 For the night time heat source I wanted to use heat mats so I opted for a Habistat mat thermostat with two heat mats connected. Unfortunately the two mats didn’t keep the cage hot enough in the cold spell we have just gone through so I fitted a 60 watt tubular heater to the roof of the cage. This is not controlled by the mat stat but is simply switched on by the night timer. The timer was set to 16 hours of daytime and 8 hours of night. I also fitted a low voltage LED night light to simulate moonlit conditions this was also controlled by the night portion of the timer. Three holes were cut into the bottom of the cage for the egg laying containers. The ideal containers for this job I found to be from Asda, they sell cheese sauce and various other items in them, the ones I bought were the 600gramm ones. They are an ideal depth and have a snug fitting lid for retaining moisture in the sand after the eggs are laid. The basic cage is made from 12mm MDF from B&Q, they cut it to any size for you if you are not to handy with an electric saw. The glass doors are cut to size by my local glass merchant, they also sell the sliders for the top and bottom. The unit took me about 3 nights to build and paint and a further 2 nights to wire up. 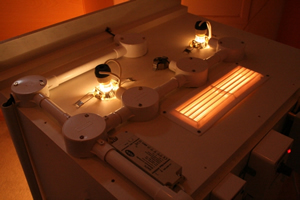 The sensors from the dimming thermostat, the mat thermostat ant the thermometer were mounted through tight fitting holes mid height in the cage wall. I left the cage running for 3 or 4 days to adjust the day and night temps. When I was sure it was running satisfactorily I ordered 100 young Locust from a live food dealer. I decided I wanted to try and maintain a temperature of 34 degrees centigrade throughout the day and 30 degrees at night. The 100 Locust arrived on the 28th of January as 5th Instars. They were fed a constant supply of spring greens, shredded cabbage, bran and Pro Grub. They also liked the odd piece of orange or banana. Five days later on the second of February the first ones began to moult and emerge as fully winged adults. This continued for the next few weeks. As my wife dislikes feeding live Locusts to Leo our African Pygmy Hedgehog I culled 50 and froze them. As the adults began to mature the males began to change from a buff colour to yellow and the females remained buff. On the 7th of February I observed the first attempts at mating. I sterilised sufficient bird sand by placing it in a tray and baking it in the oven on full power for one hour, once cooled I filled the plastic containers and moistened the sand with boiled and cooled water. Once wetted a light daily misting seemed sufficient enough to keep it moist. On Monday the 9th February I removed another 20 Locusts. The following day on Tuesday the 10th February the first hole appeared in the sand. The top of the hole was filled with what appeared to be white foam. I removed the container to check and I could clearly see the clump or pod of eggs. They were right at the bottom of the container almost 5 inches down and the column of foam extended down to the eggs almost as a plug. Over the next few days several more holes appeared in the sand all plugged with white foam. I removed the sand container and fitted its lid to retain moisture which I found out the eggs need before they will develop and hatch. The container was stored at the rear of the cage to give the developing eggs the same temperature as they were laid in. Another container of sand was put in its place so further eggs could be laid. Eggs were continually laid and the full containers again stored. On Friday 13th February, I removed a further 10 Locusts leaving us with 10 laying pairs. On Monday 16th February I removed all adults as we now had 5 containers full of eggs. The cage was stripped cleaned and sterilised and the containers returned to it after it had dried. Tuesday 24th February, the first batch of eggs seems to have swollen or grown in size slightly and seen to be getting a lot lighter in colour, almost white in parts. Wednesday 25th February, several young Locust emerged today so I placed several pieces of fresh spring greens in the cage along with a small pile of bran and some progrub to give the young hoppers a selection of foods. This gives us an incubation time of 10 days at 34 degrees since the first pod was laid. Thursday 26th February, lots more young hoppers are out today. Friday 27th February, literally hundreds hatched out today. 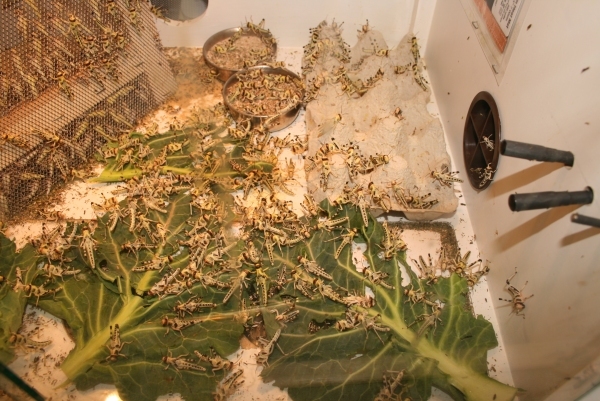 Tuesday 10th March, the locusts are now 13 days old and to me appear to be what is called 4th Instars. I have no idea how many there are but I would guess at around 500 to 600. 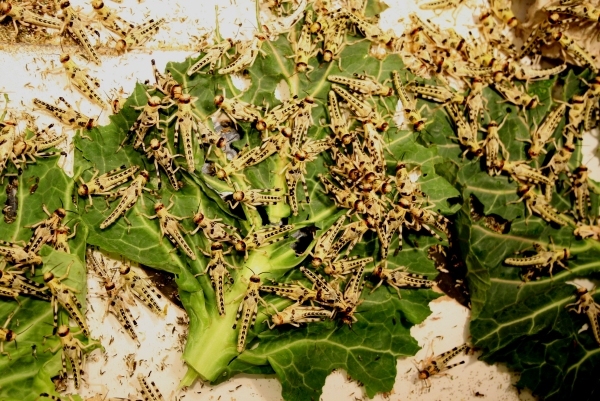 They need several good feedings a day, four large Spring Green (Cabbage) leaves last about half an hour. I removed the first batch today to feed to Leo our African Pygmy Hedgehog. 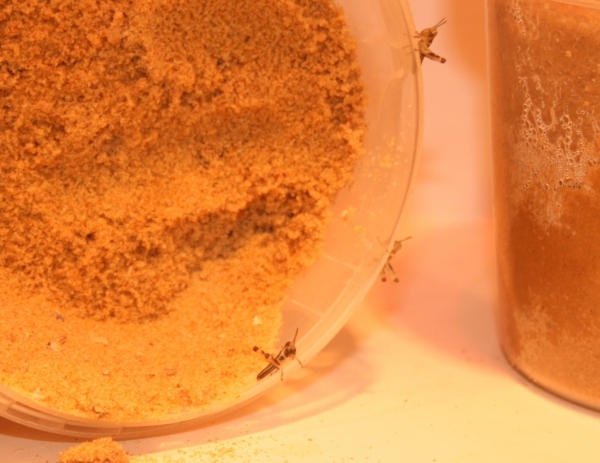 Below is an image gallery showing the development of the locusts from mating, egg laying and emergence from the containers of sand. Is a Pet Hedgehog Right for You? 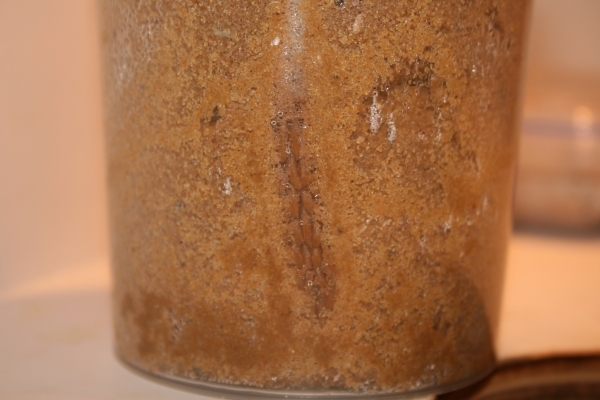 5 Comments on "Building a Locust Incubator"
Wednesday 11th March, the first locust moulted and emerged as a 5th Instar today. I guess lots more will turn tomorrow. Thats just 14 days from first hatchings. They are eating a full bag of Spring greens a day plus loads of Pro Grub, bran. hi, i have a website, regarding all the incubation tips for chicken, quails, ostrich, and turkey. how much in total did all of this cost? we get this far but our eggs just seem to turn black and die? Hello! kegeddc interesting kegeddc site! I’m really like it! Very, very kegeddc good!